On Monday the 10th of December, the euro dropped to 1.1352 against the dollar. This movement was facilitated by both technical and fundamental factors. The euro dragged the pound down with it, which plummeted against the dollar by 250 pips. The pound’s collapse was brought about by UK Prime Minister Theresa May’s decision to delay the parliamentary vote on her Brexit deal, which was scheduled for the 11thof December. The Prime Minister’s opponents have labelled her decision as cowardly. 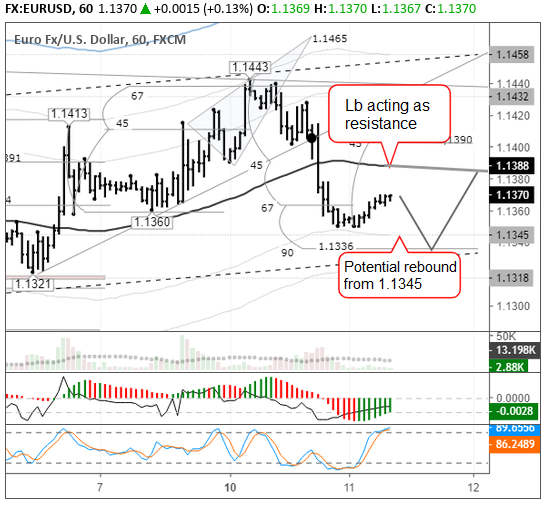 The EUR/USD pair’s decline gathered pace after the breakout of the trend line. The balance line didn’t even provide any support to the bulls. The drop came to an end beneath the 67th degree around the D1 line. The indicators on the H1 and H4 timeframes contradict each other: the H1 indicates a drop, while the H4 indicates a rise. Because of this, I’m predicting a drop to the 90th degree (1.1336) with a subsequent rebound to the balance line (1.1388). The rebound may happen sooner; from d1 (1.1345).